A vegetable farm near the Mahakali River in Sundarpur, Dodhara Chandani Municipality of Kanchanpur district is submerged with floodwaters on Thursday. MAHENDRANAGAR, July 22: Flood and incessant rain has quite troubled farmers in Kanchanpur these days. Vegetable farming has been badly affected in most of the areas especially in Dodhara-Chandani Municipality of Kanchanpur. The area, which is very well known for production of parwal (pointed gouard), is submerged in water following incessant rainfall in the last few days. “We don’t know what to do. We are extremely worried as we are going to lose this season’s whole harvest to the floodwaters,” said a local farmer Padam Bahadur Khadka. He added that monsoon rain this year was intense than earlier. “Given the rainfall that we have had this season, I fear that we won’t be able to collect single parwal from our farms,” he lamented. Flood has entered in over 60 bighas of land from the Mahakali River. 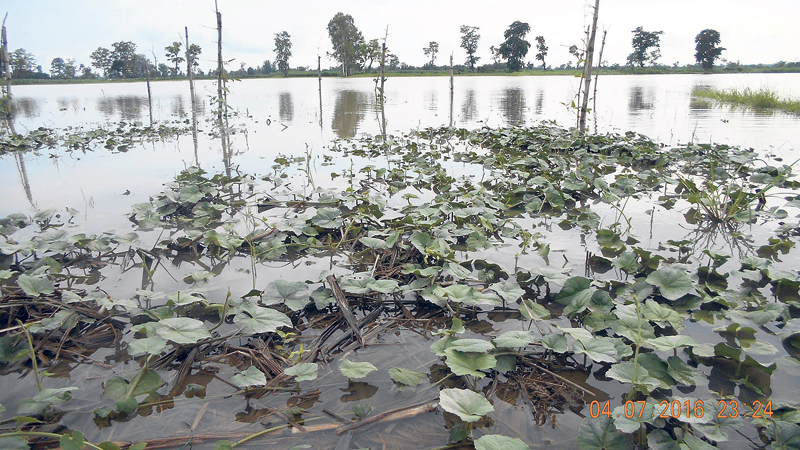 Hundreds of farmers who were about to harvest pointed gourd pretty are now in lurch as their farms have submerged in water. “Our parwals are rotting and it’s stinking everywhere,” said Khadka. Another farmer from the same municipality, Suraj Khadka stated that their farms have turned into a big lake with their parwal harvest beneath the floodwaters. “Our farms have transformed into lake. All the vegetable we had grown are submerged under the floodwaters,” he said. “Many have lost parwal farms. Some others had grown maize and rice, which has been wasted as well,” he added. According to Khadka, farmers of Gairibara tole, Deuralighat and Baitiphant, among other areas have been earning millions of rupees every year by selling parwal alone. Parwal of Mahakali, particularly, these areas, remains quite in demand. “These parwals are supplied not only to district headquarters but are also exported to New Delhi, India. In fact, farmers earned quite a lot by exporting it to Delhi alone,” Khadka said. The Indian border security forces, Seema Suraksha Bal (SSB), had been cracking down on their exports. Locals claimed that due to increasing difficulty in supplying their produce to New Delhi, some of them had switched to farming traditional crops. “Due to the difficulty created by SSB some farmers had switched to rice plantation. However, this year, no matter which crop or vegetable farming they were into, they are not going to get return from it. Floodwaters have destroyed everything,” he said. Even though exporting the high class pointed guard to India was getting challenging, the farmers were however happy as some traders from India had begun to appear in their doorsteps asking for the vegetable. “Along with that demands for the gourd in the local market was also increasing steadily,” said Sheela Khadka, another farmer in the town. She informed that once planted a parwal sapling gives return to farmer for five years. “With the floods submerging the plants, we have not only our income for this year but for a few more years to come,” she said adding that Parwal is farmed in riverbanks as it thrives in sandy land. Ram Bahadur Rokaya, a farmer from Sundarnagar, called on concerned state authorities to assist the farmers in resolving the crisis triggered by the floods. Heavy rainfall and swelling Mahakali River has put several human settlements in the district on high risk of flood. Wary of the situation, locals, political representative and security force have jointly made efforts to prevent loss beforehand. 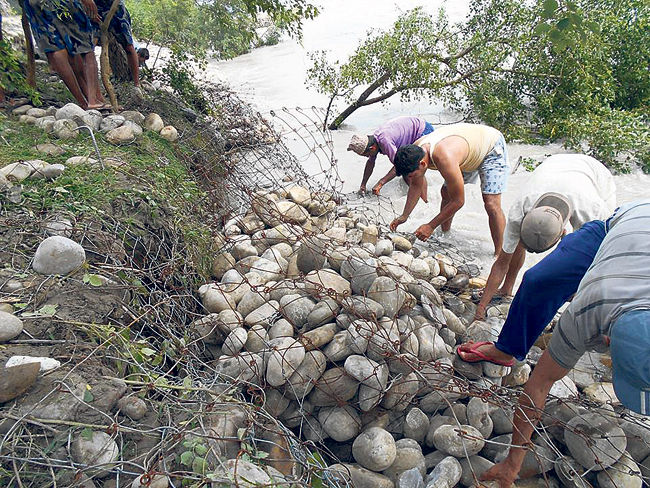 After the visible damage of the embankment in Mahakali River, concerned stakeholders have been trying to develop mechanisms to prevent overflow of water in their localities. At number of places they have erected temporary embankment to correct the course of the river. “We have been building temporary embankments in order to stop flooding in our areas. The swelling river is posing high risk,” said Bel Bahadur Rana, local leader of Nepali Congress. He added that police, army, armed police force, locals and several political party leaders and cadres have united to mitigate the risk of flood. Kishore Kumar Limbu, leader of CPN - UML from Sundarnagar stated that the risk of flood is so high that there’s no option other than coming together and working jointly to avert it. “If flood enters as we have feared, hundreds of people are going to be homeless. And considering the pace at which the river is swelling, we are terrified. So, we have been working to mitigate the risk by building temporary embankments at different places,” he said.